How do I enter marks in Curriculum Tracking? 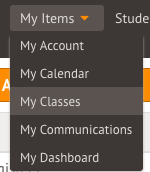 To access the marksheet if you are a teacher, select My Items > My Classes. Or Quick actions > Mark. Choose the correct class and click the Assessment Marking field. Click the right assessment in the slide over to access the marksheet. Here you can add marks or complete bulk actions. Go to Students > Assessments > Formative Tracking. First, select the assessment to submit marks for in the filters at the top of the page. 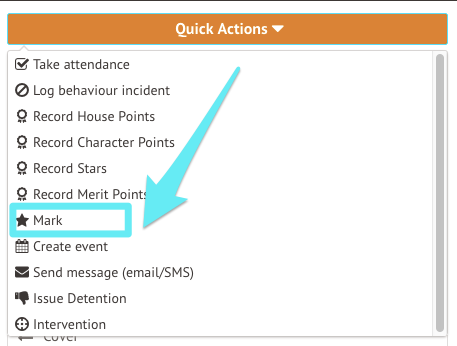 To input individual marks, simply click on the appropriate cell and choose the correct mark from the drop-down menu. Alternatively, you can also type this in manually and the system will filter the options according to the text being typed in. You can bulk mark statements by either: selecting a row of statements for a student(s), or mark against multiple statements. To mark multiple statements you need to turn the 'Bulk Mark' switch to 'ON'. Then, select the statements you want to assign a new mark to and select the mark in the 'Mark' drop down box to enter this for all the highlighted statements. ORANGE - At the end of the specified term, the student would be working below the level needed to achieve the end of year target. LIGHT GREEN - At the end of the specified term, the student would be working at the level needed to achieve the end of year target. DARK GREEN - At the end of the specified term, the student would be working above the level needed to achieve the end of year target. You may see a variation of these colours if your marking scale has more than 3 points. To record evidence, hover over the cell next to a student name and you will see an information window, click on ‘Add Evidence’. You will then see an option to add evidence, including the ability to upload an attachment or take a photo from your webcam. You can repeat the bulk edit mode to add evidence in bulk for all your students. You also have the ability to add the chosen students to new or existing intervention and custom groups should you need to.